As a child, I got my hands on books I could find at my school library and at every bookstore that sold books in English. I started reading almost 10 years ago, and back then I was just getting to know the book world. E-books and kindles were non-existent to me at that point. Several years ago, when the iPad and Kindle came out, my dad thought it would be a good idea to get me one, considering the amount of books I constantly bought/ordered. Thus, I found an alternative to my reading. 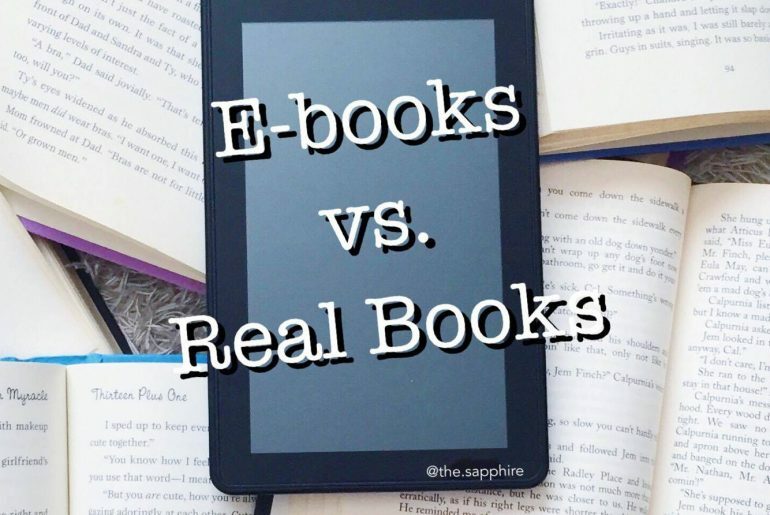 Though I am not as acquainted to the E-book world as the Real Books world, I feel that I have, to some extent, the experience to share with you the thoughts that I have on these two very distinct forms of reading. Below I have made a list about the benefits of E-books and real books. I decided to ignore the negative aspects of each, though I will mention some of them along the lines, just to give you a fuller perspective. Instant dictionary: This is my #1 reason for using a Kindle. I hate to read something, come across a word I don’t know, and not being able to look up its definition immediately. When this happens whilst reading a physical book, I usually force myself to go past it to continue with the flow of my reading. But the Kindle mostly solves this problem (as its dictionary is not perfect), so I’m happy. Convenience: Instant access to the book in just a few clicks. If you’re like me, then that’s very useful – in the place I live the bookstores rarely have books in English, so I used to order them on Amazon. I hated ordering them and waiting for them to arrive, besides the additional costs of shipping. No more shoving books in random places and leaving them to collect dust. Portability: You can have several CR’s with you all inside this portable device, which makes it so much easier when you’re traveling or constantly moving to places. Finance: Most, if not all, books on Kindle are cheaper than physical books, for obvious reasons. Well, unless you prefer cheaper second-hand physical books. There are some Classics that even come free. As for me, I have found Kindle Unlimited – a subscription to explore a wide range of books for free (but you can only borrow the books whilst you are subscribed to it). Simulation: You could be reading “Les Misérables” or “Fifty Shades of Grey” and no one would know, unless they actually craned their neck next to your face to see the small-lettered title at the top of your Kindle. Very unlikely, though. Fashion: You can’t put a case on the device itself, but you can buy Kindle cases and decorate them yourself. Listen to the book while you’re transporting to one place to the other, and can’t visually read the book. Experience: The sight of the cover of the book you have been so eager to read. Brushing your fingers against the fresh pages, and turning them as you go deep into the story. Having the book right there with you adds to that special journey you delve into whilst reading a book. A Kindle just doesn’t do that for me – it’s all too electronic and modified for me. Holding the book in your hands, I believe, urges you to continue reading. Whereas a Kindle book doesn’t provide that realistic feeling. Collection: Whenever you step into a library, Barnes & Noble, or any bookstore you visit, don’t you just love the feeling of innumerable books surrounding your view 360? Buying books and adding them to your bookshelf collection is another reason in itself. It’s a showcase to how much you have read and how much you plan to read. It’s a visual representation of your book world. Aesthetics: The smell and design – enough said. After writing this list, I feel like an advocate of E-books. But honestly, I love both as much. I mostly use the Kindle because it’s easier to read and I can constantly browse new books; I appreciate real books because they complement the stories that come alive at each page. And, honestly, I really want a bookshelf full of books and nothing else. When I grow up and it’s time to get my own apartment, I will have a room with a huge window (for lightning purposes), a beautiful large bookcase, and a very comfy chair. And maybe a desk. It would be my reading/working area, the perfect combination. This was a wonderful post! I’ve scanned a lot of articles revolving around this topic and this was informative, and gave different views. I personally enjoy my ereader a lot because sometimes I get distracted by how many pages I have left in my book, the weight of it in my hands, and how many pages i’ve read versus how many pages I haven’t. Maybe it’s me but i find it easier to concentrate and it feels so good when books are completed on my virtual shelf. HOWEVER, i totally agree with you when you say physical books look prettier and how it’s so totally useful for instagram! That’s true. The e-reader doesn’t exactly have ‘pages’, so you don’t physically see how long/short the book it is (I still use the percentage to guide myself though hehe). And thank you so much for reading and commenting on my blog!! ? I’m also kind of torn between books and ebooks. I started reading books on OverDrive and iBooks just last year because it’s so easy and convenient – I mostly read while on the bus to and from campus. I also love how I can look up words I don’t understand (I thought I was the only one! ?). There are also so many free ebooks out there, so a lot of the time I end up not paying anything. The problem is that I find that I don’t remember the story as well when I read on my phone compared to reading a physical book. I think the muscle memory of turning the pages and rereading your favourite parts over and over again helps you to remember the story better (especially if the book is a part of a series). Great post! And your blog is so BEAUTIFUL!!! ? I thought about information retention too. I remember reading somewhere that you remember the things that you physically read (I think I was searching for exam preparation techniques hahaha) because you kind of guide your finger along the page. And I kind of believe that, though. But when I’m trying to read harder (Classic) books, in which there are even more words that I don’t understand, I think I would rather read them with the Kindle… so I guess it’s kind of like a debatable argument between the 2. Thank you Cherry! 🙂 Lol I wish I could read on my phone too, but I have such poor eyesight that I would rather not risk it haha. Lol that’s a good point! I try not to be on my phone as much as possible xD but my kindle fire is a bit heavy to lug around everywhere haha. I find that I read faster on the kindle though, does that happen to you as well? LOL I’ll go check it out! And thanks for your comment ?? Personally I am not a fan of eBooks but certain books (like H.P Lovecraft collection) had to be in eBook format though I would love to own a paper/hardback version too if it exists. Yeah, I get that feeling : I’m reading the entire Harry Potter series on Kindle because it would be ridiculously expensive for me to get my hands on a copy of them right now, but I’m crossing my fingers and hoping I can get the actual copies one day ? when I don’t know the author or the reviews make me doubt I read the ebook first and only If I really love buy the physical copy . Nicee, that’s a great (and safe) idea ? Wonderfully thought out post! 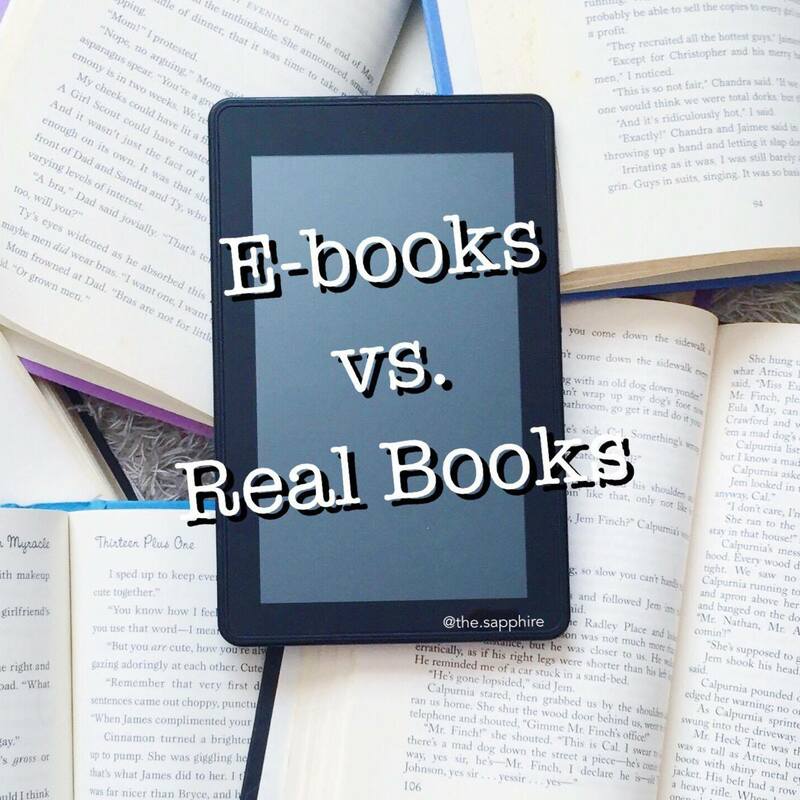 I agree with every single one of the points you made for both the e-books and real books. I, too, have a hard time deciding if I like e-books or real books more. I suppose it depends on what I’m doing/where I’m going e-books are nice for travel (I like them for school books as well). I also like the fact that even if one device goes, their still there in the app ( I recently had my android tablet die on me and replaced it with an iPad and all my books were still there). That being said, however, I much prefer the feel, smell, and sight of a real book. Just looking at my bookshelf can cheer me up on a bad day and nothing beats rereading a childhood favourite and running your hand down the page as you read. Thank you soo much for your comment! Whenever I traveled (when I was younger) I would go crazy at the bookstore every chance I got, and now I have a basement filled with all my bright childhood books and soo many memories come back to me when I even merely glance at them. I can’t really buy many physical books due to where I live right now, but I am so definitely having a books-dedicated room when I’m older (bookshelf, reading area, etc) to make even more memories ?